Arranging a board meeting agenda or a PTA committee meeting agenda is complicated because people and schedules change. Putting together a workable business meeting agenda can be frustrating as speakers cancel, attendees sign up at the last minute, or presentations shift around. An Adjustable Meeting Agenda template can be a welcome time-saver for a busy manager. Such a template would automatically schedule agenda items so no calculations about the time allotted to each speaker is necessary. Last-minute updates are no problem and can be completed quickly. Read more to learn how this Excel template can work for you and make your business meetings agenda hassle free. The template is a simple Excel worksheet which handles start and end times automatically. Every time a speaker is added, all time allotments are adjusted automatically. Last minute additions are a snap. The template is absolutely free, user friendly, and available for download on this page. The process involves filling in the presenter’s name, item being presented and the scheduled start time. Gray areas on the template automatically fill in the end time, duration, and the next start time based on your entries. Customize the template to your business specifications and start scheduling. Each column has a drop down box which includes various sorting selections allowing customization of the worksheet. The business can be sorted by start, end, or time and allows you to choose the options of from smallest to largest, largest to smallest, or by using filtered, assigned colors. The adjustable meeting agenda can also be sorted by the item or presenter alphabetically or filtered, assigned colors. 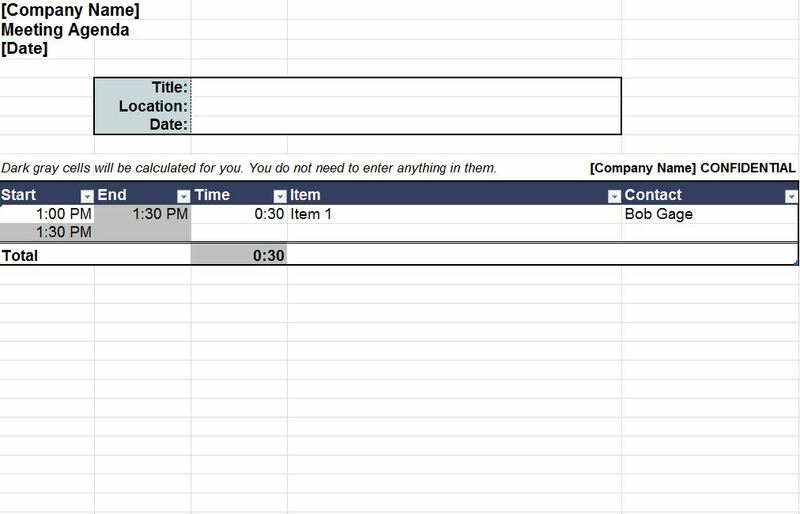 Customization provides for a finished Adjustable Meeting Agenda worksheet that is accurate and up-to-the-minute ready. The template give businesses a quick, easy way to prepare and generate business meeting agenda that are professional and effective. A well run meeting begins with an accurate, well-planned meeting agenda. Download the Adjustable Meeting Agenda template now.